Headache is a complaint which all of us experience sometime or the other. It is not actually a disease, but a symptom of many different disorders. Headache really makes a person feel miserable. The causes are many. 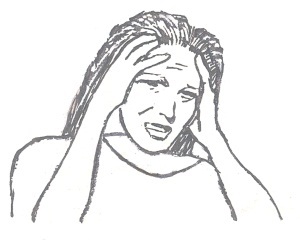 In migraine or hemigrania, usually one side of the head is affected, left or right. These headaches recur at intervals and are frequently accompanied by vomiting and disturbances of vision. Women are usually more prone to these headaches. Migraines are also due to mental tension, emotional strain and insufficient sleep. Sinusitis causes headaches felt in the forehead due to infection of nasal sinuses. Meningitis pain is felt at the base of the skull along with stiffness of neck and rise of temperature. Strain of eye muscles or increase in number causes pain in head. Deficiency of red blood cells leads to poor oxygenation. Brain tumor causes headache. Premenstrual tension, constipation, menopause, constant exposure to the sun, insomnia and hangover due to drinking as well as cervical spondylosis causes headache. People seek instant relief and resort to the easily available aspirins and other common tablets. But this is very wrong, as aspirin has been known to cause various unpleasant side effects like stomach upset, heartburn, nausea, vomiting and many such gastro-intestinal problems. In case of yoga students, regular practice of Asanas and Kriyas reduces the chances of suffering from a headache. Massaging the forehead gently, Jalaneti and Anuloma – Viloma help. Basically change in attitude through practices like Anitya Bhavna helps us to keep this dreadful complaint away. Published in the October 2011 edition of Yoga & Total Health Magazine.